We spent a total of three days in Florence. There is such a wealth of beauty and history in this mid-sized city that we have decided we need to go back and rent an apartment right in the city for a couple of weeks. Ahhh……that would be the life. Maybe someday. 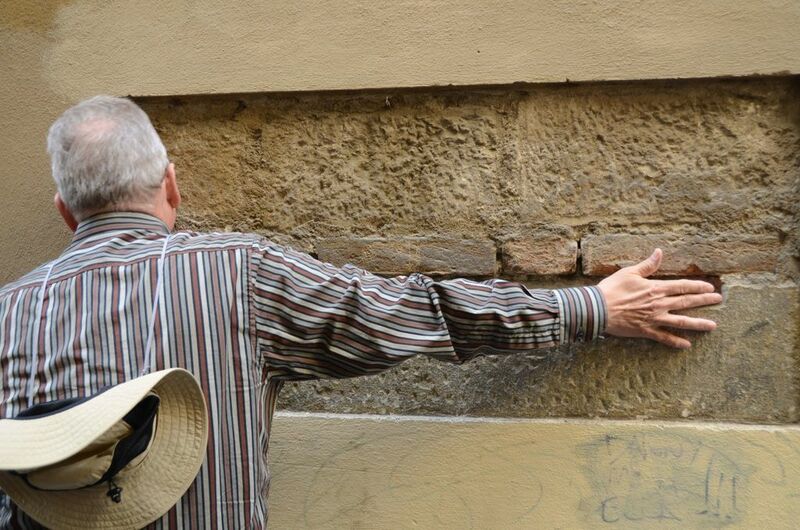 Our trip to Florence started a bit rocky. We got our schedule mixed up and thought our trip to Florence was scheduled for the following day. So we are hanging at the villa, leisurely dragging around, and then Pop comes running in saying we are supposed to be in Florence in an hour. Well, considering that we were at least an hour away just driving, and we were all in various states of bed head, that didn’t seem likely. Luckily, we were able to reach our tour guide and arrange for a later meeting. Then we ran around like crazy people trying to get out the door. Now on to PARKING in FLORENCE. We parked at the train station. To the tune of 50 EURO a DAY. I am not kidding. We later figured out there is cheaper parking other places, but those spaces are not quite as conveniently situated. Convenience Schmovenience. Parking for 50 EURO A DAY????? Thanks Grandpa, for getting that. On my Florence Day #3 post I will attempt to map the cheaper parking. Well, the “Arrival” was not that pleasant. Luckily, that unpleasantness lasted no longer than us getting our gear together and finding our tour guide. What followed was one amazing Florentine kind of day. 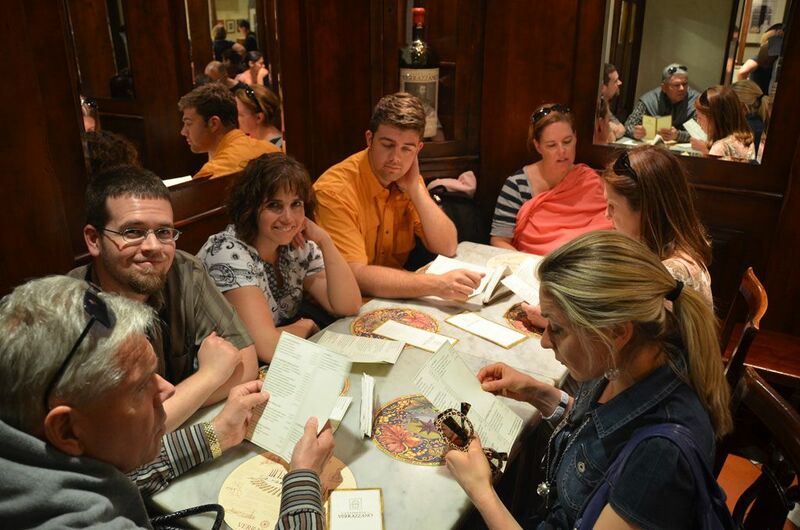 We were very lucky to be privy to a tour guide of Florence. Again, thanks to Grandpa, we had a very pleasant Australian woman by the name of Freya Middleton to take us around Florence. Although she is pricey (at least I thought 60 Euro an hour was steep), I would readily book her for at least a half a day if I ever have the pleasure of visiting Florence again. She has a solid background in art and a dynamic personality which makes her interesting to listen to. 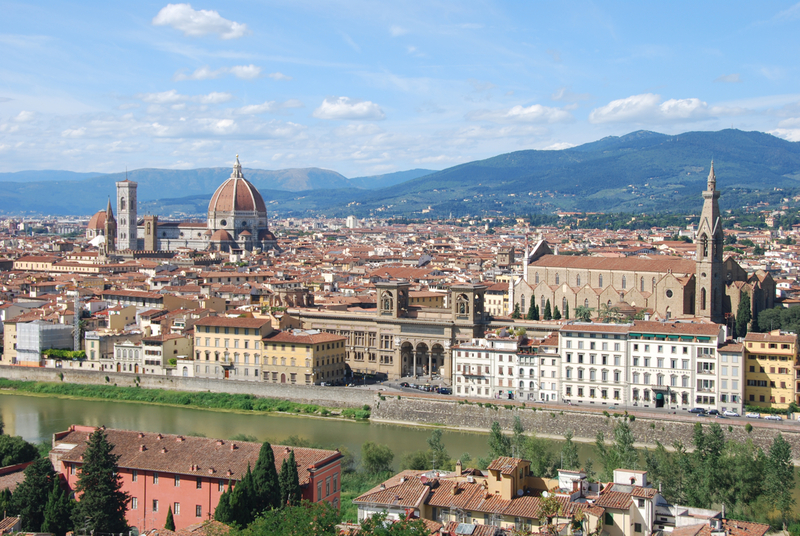 She knows the history of Florence, and talks about the Medici like they are old friends. As we walked through Florence, she didn’t just point out the obvious. She was privy to odd factual bits that really made the modern-day city of Firenza come alive in its Renaissance splendor. For instance, here is one little tid-bit she pointed out. As the cloth capital, it would make sense that there would be places about where one could check the accuracy of their fabric purchase. You wouldn’t want to be shorted! 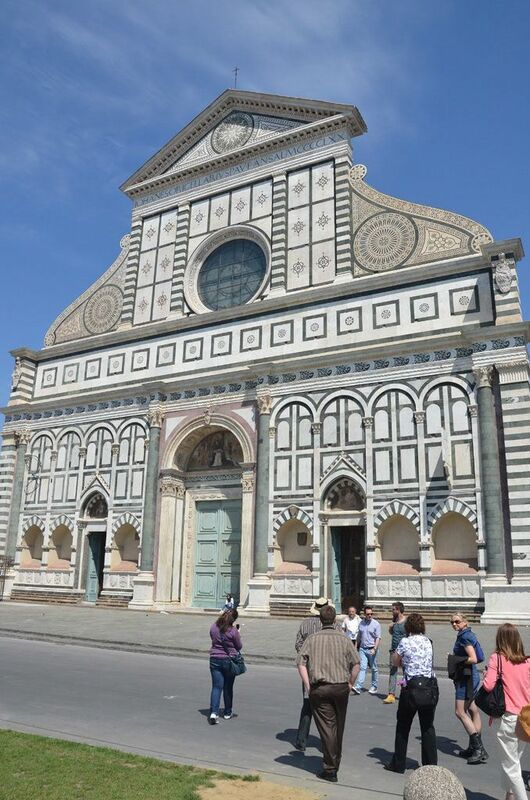 The first destination was Santa Maria Novella. This is the quintessential Italian Renaissance church. We were able to visit the interior of the church later, but today Freya wanted to take us somewhere “less traveled.” And boy am I glad she did. I can imagine that many people miss this little lesser known gem. To the left of the church, enter the cloisters. 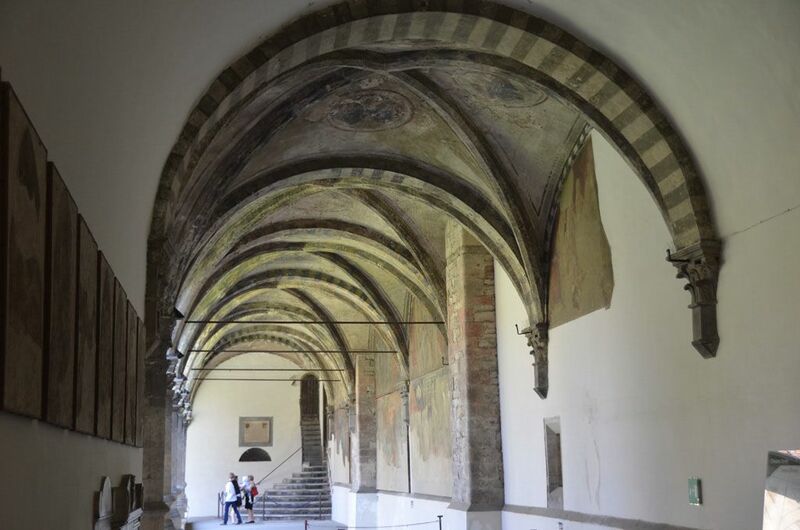 In these quiet, unpopulated cloisters you can enjoy a variety of frescoes on your own terms and at your own pace. The most intriguing site is the Spanish Chapel, named such in 16th Century as a special place for the Spanish colonizers to worship. The building was erected two centuries earlier. 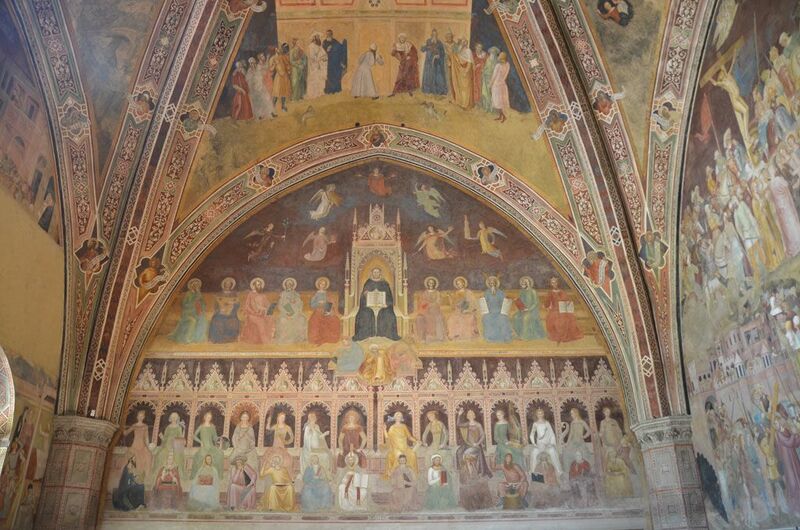 The entire chapel is covered, floor to ceiling, with exquisite frescoes by Andrea Buonaiuto. The frescoes depict the life and mission of Jesus Christ, whilst including the status of the Dominicans and personifications of Catholic Doctrine. I would highly recommend this location to anyone who loves art. It was about three Euro to get in, but I would say for the art and peace worth every cent. Walking up to Santa Maria Novella. Quintessential Renaissance Facade! 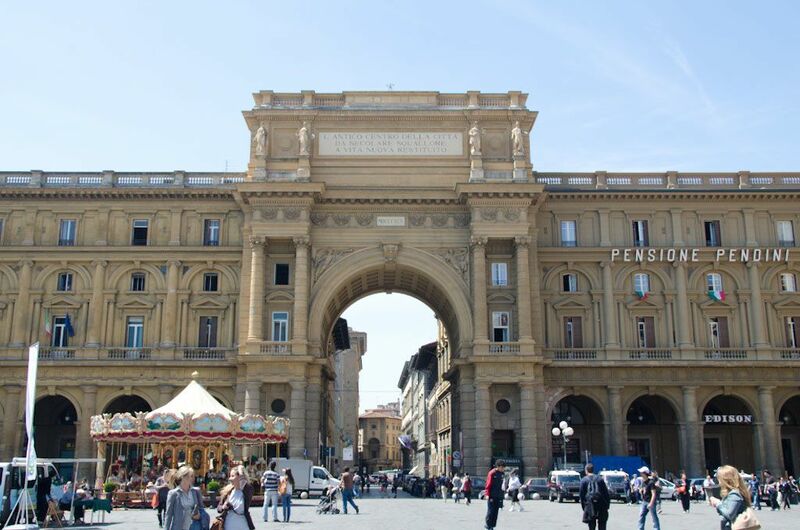 We then walked from Santa Maria Novella past the Palazzo Strozzi as well as the Piazza della Repubblica. 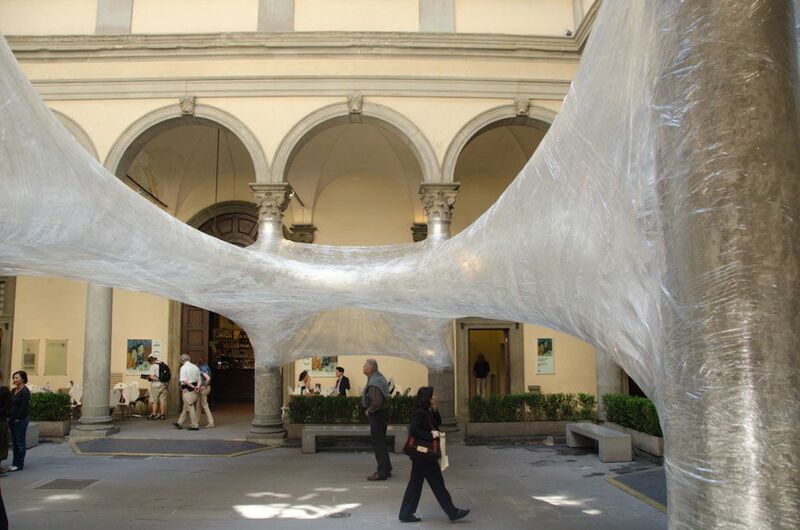 There was an unusual modern art installation at the Palazzo Strozzi which was made even more eye-popping because of the juxtaposition of old and new. Freya took us to one of her favorite lunch locations, Cantinetta dei Verrazzano. I thought this was the perfect lunch! We were taken care of very well, and had a large table towards the back that afforded us some privacy in this busy place. They are most known for their focaccia, which is brought to the table in all its varieties: roasted tomato, stuffed with garden peas, cheeses and herbs, mushroom….the list is endless and all of it delicious. The bread is chewy and the topping and fillings bursting with flavor. After the focaccia we were brought an antipasti platter full of cured meats, cheeses, and olives, along with more bread and olive oil. We also tried the house shredded pork. For dessert we were brought just a tiny bite of spiced bread, topped with a slice of fragrant, nutty cheese, drizzled with honey and sprinkled with orange zest. Freya has some arrangement with the owner, so I don’t believe you can just go in an order all of the items we had for the price we paid, but all of the items appear on the menu. After lunch we visited the Loggia, which is a covered area by the Uffizi stuffed with famous sculptures. This area is also the original location of Michelangelo’s David; a copy now resides here while the original can be found in the Academia. Freya told us a fascinating story of competitive propaganda: the David was originally placed here as a symbol for free Florence; later, when the Medici returned, they erected this gruesome statue (in bronze, no less!) to make a statement in regards to their power over Florence. 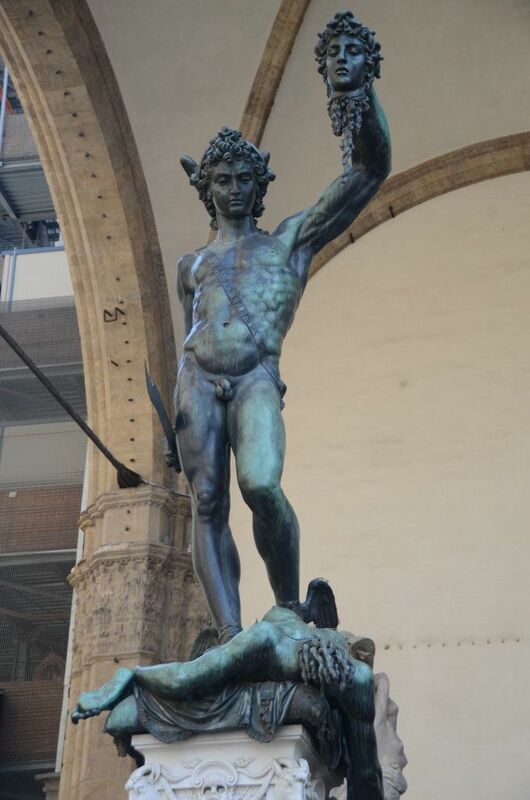 Benvenuto Cellini, Persues with the Head of Medusa, Loggia dei Lanzi, Florence, Bronze Sculpture, 18’. We next visited Santa Croce, the church which houses the tombs of some very important Italians: Machiavelli, Michelangelo, Galileo, and Rossini. They also have the “tomb” of Dante. Or at least they claim to. Dante’s remains are actually in Ravenna. Speaking of Dante, there are quotes on the buildings everywhere. He is very highly regarded in Florence, as he should be, but ironically, he was actually banished from Florence and died away, in disgrace. I guess Florence is now trying to make up for it. They want him there after all! By now we were pretty much exhausted. But we had one more final visit to make. We climbed all the way up a massive hill to visit St. Minias on the Mountain. We were all wondering if this place was worth the trip, but the views alone justified the exertion! Look at what you see from the top! The church itself, even without the view, is lovely. The floors are made of intricate mandala shapes with a distinct middle eastern flavor. The striped ceiling and decorative patterns also reminded me of mosque interiors. The church was empty of tourists, and we were lucky enough to arrive at the same time as a musical service, all sung in plainchant. It made the church seem otherworldly. We were tired, our feet hurt, and we wondered if we would be able to move the next day. But we got to see several off-the-beaten-path gems of Florence, the quintessential Renaissance City.